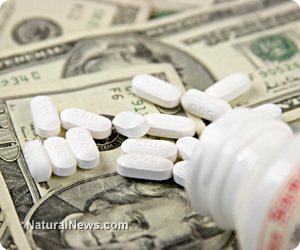 (NaturalNews) Many Americans are now looking outside the United States for cheaper prescription drugs. The pharmaceutical industry estimates the cost of developing a new drug is at least 800 million dollars. This helps explain the high price that is passed on to consumers, but does medicine have to be this expensive? According to the National Consumers League, consumers are paying too much for prescription medication. This has led many to cross the border and start buying their prescriptions at half the price in places like Canada. Alison Rein of the National Consumers League, says, "The fact that busloads of Americans are crossing the border buying medications or going online is a clear sign that the public finds the price of prescription drugs is too high in the United States." According to the Centers for Disease Control (CDC), the United States out-of-pocket drug consumption exceeds $45 billion annually. The agency also reports that one of every five Americans ask their doctor for a less expensive prescription. The horrible reality is: the 11 major drug companies in the world come up with an annual $85 billion profit. This industry is obviously monopolizing on people's illness, and they're not even sharing any of the billion-dollar profit by lowering the prices! Either way, the combination of severe side effects and high costs is detracting people from the pharmaceutical philosophy altogether. Many people are now seeking alternative answers as well. If prescriptions are too expensive, why not try prescribing your own medicine? As Americans look for more frugal answers to their health, the truth may be just under their nose. As awareness spreads, many are learning how to make their own medicine. Real medicine might not be in the doctor's hands anymore. Many medical doctors are beginning to encourage their patients to seek nutritional answers. Many doctors confess that they wouldn't consume the very drugs they prescribe to people. Maybe prescriptions are really just bogus disease management tools designed to keep people coming back to an overly priced, overrated juggernaut. There are answers outside the industry. Real medicine might actually be just outside the doctor's office building, growing in the nearby field. Naturally existing plants like red clover or barks from the white willow tree are cheaper, more effective medicines for those who utilize them. Red clover is an abundant growing blossom found growing in fields, yards, parks, and ditches. It contains many valuable nutrients including calcium, chromium, magnesium, niacin, phosphorus, potassium, thiamine, and vitamin C. Brewed as a tea or eaten in salad, red clover is an essential food medicine that is a rich source of isoflavones. Studies show that isoflavones help with hot flashes, breast enhancement, lowering cholesterol, improving urine production and circulation of the blood. When used in women, red clover prevents osteoporosis. In men, it limits the development of benign prostate hyperplasia. Just beyond the red clover field, one might find a beautiful drooping white willow tree. A trunk full of pain relief, the bark of the white willow tree has a long history of use. According to the University of Maryland Medical Center, white willow is used to help with osteoarthritis, lower back pain, and headaches. Its main ingredient, salicin, acts much like aspirin. In fact, in the 1800s, salicin aided in creating aspirin. Salicin doesn't work as fast as modern aspirin but its effects last longer. White willow is virtually free to obtain as well and doesn't damage the liver like pharmaceutical pain killers. When the bark is steeped in glycerin, vinegar, or alcohol for up to a month, the salicin is extracted into the liquid medium and preserved, creating a homemade remedy. When the bark is strained out of the mixture, the resulting liquid medium can now be used under the tongue or in a glass of water as a safe pain relief. There are cheap, easy ways to stay healthy and live strong, without prescriptions. Prescriptions are draining the pocket book of countless Americans and breaking down their health along the way. Natural options will grow in popularity as people turn away from the overrated, overpriced system of pharmaceutical drugs.